Top off your wedding table with an exquisite centerpiece that expresses your unique celebration on your special day. Flowers etc. can create that unique centerpiece for your celebration ranging from formal candleabras topped with a fresh floral arrangement to fresh arrangements in silver bowls to tall cylinder or coned vases filled with your favorite fresh flowers. For those who love the prestidge of a totally unique creation, Flowers etc. 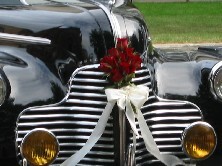 can match your exisite taste for your wedding celebration or special event. 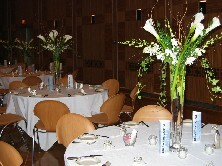 Visit our ballroom gallery for some of our previous centerpiece creations.